Considering how outlandish some of the GI Joe characters were, it's easy for the more average guys to get lost in the crowd. But sometimes, there's something to be said for being plain. Lt. Torpedo was a scuba instructor prior to enlistment. Attained black belts in three martial arts by age 19 (Wushu, Kenpo, and Goju-Ryu). Proficient with Filipino butterfly knife (balisong). Training records after SEAL School: CLASSIFIED. Qualified Expert: Most NATO small arms, NATO and Warsaw Pacts explosvie devices. Torpedo was pretty much the most boring GI Joe. Not that the figure was dull, but that the character was - his filecard specifically said so. He had the personality of dish water. While all the other Joes were, I don't know, playing poker or going out to bars, Torpedo was reading training manuals. He's got no sense of humor, and spends his free time doing the kind of physical training everybody else has to do under orders. Not the kind of fellow people want to spend a lot of time around, you know? The figure is an update of Torpedo's original costume, of course (rather than the SpyTroops version), which makes him a very pedestrian offering. He's wearing a black and gray wetsuit, which is a very simple, realistic outfit. The sculpted detail is impressive, with pouches and whatnot on his shoulders, and the kind of big thick wrinkles you can only get from wearing rubber pants. The paint is mostly good, with a decent edge between the light and dark sections of the wetsuit. His skintone doesn't spill out onto his hood, though it is surprisingly pale - he is a native Hawaiian, after all. He should be browner. His belt is grey and silver, and the only area that seems lacking are the clips molded on his back. The accessories get nice paint apps, as well, so let's take a look at those now, shall we? 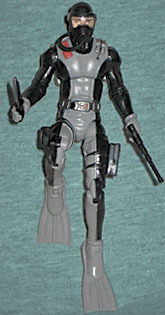 Torpedo has working holsters on both his legs: the left leg accommodates a silenced pistol, while the right holds a big knife. The knife is molded in black, but has a silver paint app along the blade to make it look sharp. His main weapon is a harpoon gun, just as it was in the '80s. One feature that's updated is his diving mask: formerly a sculpted part of his head, it's now a separate piece that slips over the head nicely. The lenses are clear, so you can see the face behind them. He's wearing gray flippers, which not only have pegs to slip into his feet, but also have holes so he can still use the footpegs on vehicles or his stand. Nice work! His gray backpack is a direct update of the orginal accessory, with one cool new addition: the red air tanks are separate pieces that you can pop out of place. In the cartoon, Torpedo's few appearances showed him as something of a joker - not at all like he was presented on his filecard. Of course, he only spoke in nine episodes, so it's not like there was a lot of opportunity to give people the wrong impression. He may be a dull, forgettable character, but thanks to some awesome updates, he's a must-get figure. How unexpected!